蘇麗珍の着る旗袍が際立って浮いているアパート地下の飲食店。王家衛『花様年華』 (c) 2000 by Block 2 Pictures Inc.
香港の旗袍は1960年代に領が高かった。 仕事中の蘇麗珍。王家衛『花様年華』 (c) 2000 by Block 2 Pictures Inc.
麻雀中に離籍する周慕雲と擦れ違う蘇麗珍。王家衛『花様年華』 (c) 2000 by Block 2 Pictures Inc.
Qipao in Hong Kong：All of “In the mood for love” begins with the Qipao: This article translated / supplemented Kang Xin “Shunkou Movie Wang Kar-wai” Chinese Red Sea Publishing Company, 2004, pp. 152-153 (姜鑫编 春光映画 王家卫 中国广播电视出版社出版 2004年). 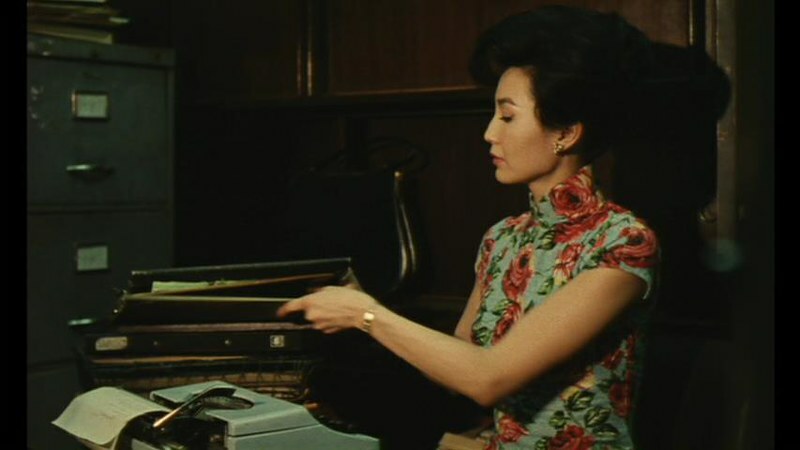 This is an essay describing the movie “In the mood for love” directed by Wang Kar-wai, which touched upon the style of the director, capturing the meaning of the flower like the year-end flower established in Hong Kong in the 1960s. Please feel the meaning peculiar to the Qipao of Hong Kong.